Dr. Roy David, San Diego Facial Plastic Surgeon, confirms that there was a surge in male cosmetic surgery procedures in 2014. With over 20% of his procedures done for men last year, he expects that the 2015 numbers will be even better. Dr. Roy David of San Diego reports seeing a dramatic increase in male cosmetic surgery procedures and believes the trend will continue. Dr. Roy David confirms a 2014 report by the American Society of Aesthetic Plastic Surgery that men had more than 1 million cosmetic procedures performed last year, representing 9.4% overall. This a 273% increase from 1997. The report is available here http://www.surgery.org/media/news-releases/the-american-society-for-aesthetic-plastic-surgery-reports-americans-spent-largest-amount-on-cosmetic-surger. Dr. David believes men are becoming much more receptive to cosmetic procedures due to the many TV shows now showing men having cosmetic surgery. He reports that the 2015 numbers will be even better; Dr. David states that over 20% of his procedures in 2014 were for men. Considered to be one of the best facial plastic surgeons in the San Diego area, Dr. David reports that many couples are now coming in to have procedures done at same time. He states that many couples are opting for facelifts or facial rejuvenation procedures together. 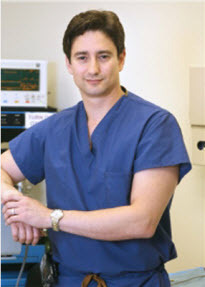 Dr. David said, "Especially during the Valentine’s Day period we see a spike in couples having procedures together. In the past the husband would be more of the driver to and from the practice, but now men want in on looking younger too." In addition Dr. David has added hair restoration services to his practice utilizing the Neograft technology. You can visit Dr. David's hair restoration site at http://www.sdneograft.com. Dr. David reports seeing many of these male customers also crossing over to the cosmetic side of business once they see the results of their hair re-growth. Dr. David said, "Many patients look 10 years younger after having hair restoration done, and if they decide to add an eyelift too, the results are amazing." Many men coming in to his office state they want to look younger to feel better about themselves, but many are also reporting it helps keep them competitive in the business world. By looking as young and confident as they feel, many men believe this will more likely help them climb the corporate ladder. Dr. David also reports many men that are going through a break up or divorce are turning to cosmetic surgery to help them compete in the dating world. The number of men now having botox injections performed has also jumped by 310% since 2000. Dr. David confirms this report and has indicated many men are also opting for facial fillers. Other non-surgical procedures that are becoming popular with men are chemical peels, laser hair removal and derma fillers, according to Dr. David. Dr. David reports the top three procedures he is seeing with men are hair restoration, rhinoplasty, eyelid surgery, and facelifts. He states that rhinoplasty and hair restoration procedures are typically performed on younger men while eyelids and facelifts on older men. Dr. David believes this trend will continue and believes in the near future cosmetic procedures for men will almost be equal women. Dr. David said, "When you can transform a man’s face from a tired, worn-out or even angry look it changes their confidence and attitude in a dramatic way. It is a life changing event for many men. When you have a man that is insecure about his looks it can have devastating psychological toll on their confidence, these procedures are helping many regain their youth but more importantly their confidence." Dr. David is a double-board certified by the American Board of Facial Plastic and Reconstructive Surgery, and the American Board of Otolaryngology-Head and Neck Surgery. Dr. David is a fellow of the American College of Surgeons, the American Academy of Facial Plastic Surgery, and the American Academy of Otolaryngolgoy-Head and Neck Surgery. He is one of a select group of plastic surgeons to complete a prestigious fellowship in Facial Plastic Surgery under the auspices of the AAFPRS. To learn more about Dr. Roy David visit him online at http://www.sandiegoface.com.